HOME > TERM > What are white blood cells? Negative health factors are all around us, such as the flu virus, germs, environmental pollution, food additives, pesticide pollution, imbalanced diets, a stressful society, not enough exercise, etc. White blood cells clean the body by removing germs and foreign matter entering the body from outside, as well as foreign matter produced by the body (cancer cells, dead cells, bad cholesterol, etc.). White blood cellsare made from bone marrow. 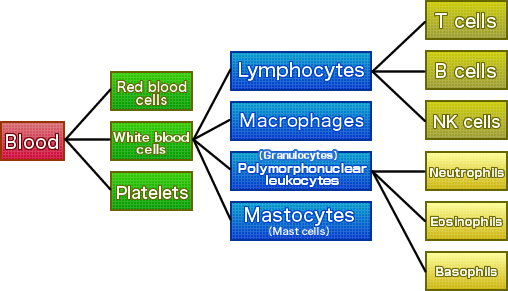 White blood cells enter the blood vessels through the lymphatic system that runs throughout the body, allowing them to patrol our bodies and safeguard our health.